The Zavio CamGraba NVR software is capable of recording in multiple modes, such as Continuous, Motion and Schedule. Users can configure recording schedules to be used every day or have multiple recording schedules for each day of the week. Another feature is motion recording, which only records when motion is detected by the camera. Users are also able to mask out areas that they do not want motion detected, such as a swaying tree. 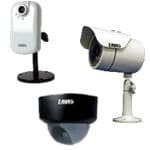 Audio recording is possible as long as the Zavio IP Cameras you are using have a built-in microphone. 3. Once in the Configure menu, select the Start and End time of the recording schedule you want to enable. Then select the Pre and Post Record time (Pre - How many seconds to record prior to a motion event. Post - How many seconds to record after a motion event takes place). 4. Then if you have audio devices in place, go ahead and enable audio recording. 5. Now select either Always Record (Around the Clock Recording) or Motion Record (Only records when motion is detected). If you selected Motion Recording, choose the Sensitivity level and Frame Interval. Then select the area of the screen you would like the motion detection to be by left-clicking and dragging your mouse across the left video screen.